Tackle the toughest jobs with the PRO Z™ Series, the industry’s only commercial zero-turn mowers with triple-7-gauge steel cutting decks. The PRO Z™ Series features maintenance-free spindle assemblies with sealed ball bearings to minimize downtime and steering options for increased stability on hillsides. 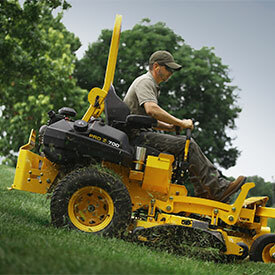 All backed by a 3-year, no-hour-limit warranty and an extended 5-year, 1,750-hour deck assembly warranty. This zero-turn is built to last for the long haul.